LHASA: Although jade and porcelain bowls are now common in Tibetan households, Tibetans still like to drink their buttered tea from wooden bowls. Wooden bowls are in fact an inseparable part of Tibetan life. When serving buttered tea, Tibetans always place two wooden bowls on the main tea table in the sitting room, a big one and a small one. The big one is for the father and the small one for the mother. In even wealthier families, every wooden bowl is inlaid with silver and carved with patterns, with only a spot the width of a finger left in the centre of the bowl to show its wooden base. Each bowl has a lid and a tray as well, both made of silver. The lid is shaped like a tower and inlaid with silver and gold, on the top of which is a red agate serving as a handle. The tray is intriguingly unique. It is in the shape of eight lotus petals, with a good luck symbol engraved into each petal. These are the traditional eight propitious symbols. You might wonder why the bowls of the father and mother are always of different size. It is generally accepted that this is a sign of respect towards the father, whose position in the family is considered to be higher than that of the mother. Maybe this comes from Tibetan history. The old feudal local government stipulated in its statutes that "people are divided into three classes: upper, middle and lower, with each class further divided into three sub-classes: upper, middle and lower. The poor belong to the lower sub-class of the middle class, and their lives are valued at 30-40 taels of silver. However, women belong to the lower sub-class of the lower class, and their social position is equal to that of vagrants." Even to this day, if a couple visit another family, the wife will be sure to be served tea in a smaller bowl than her husband's, otherwise, it would be considered impolite. In everyday life, the wooden bowls are always kept neatly in a cupboard, taken out when needed and put back after use, with everyone having his or her own bowl. There is a saying that goes: "The husband and wife use different bowls, father and son use different bowls, mother and daughter use different bowls and brothers use different bowls." Any child who attempted to take his or her father's bowl and drink from it would be severely criticized. Usually it would be the mother who would declare: "If you do this, you will not have any good luck in the future." The affection between husband and wife is also seen in the wooden bowls. When the husband is going on a long trip, after the wife sees her husband off and returns home, she first fills her husband's bowl with buttered tea and then pours some for herself. When she has finished her own tea, she pours out the tea from her husband's bowl onto a cleaned place and puts the bowl neatly back into the cupboard. When her husband comes back from afar, she fills his bowl with hot buttered tea and presents it to him with both hands. Grown-up children live separately from their parents after they marry, and when they visit them, they still use the same wooden bowls they used before they left home. The only difference is that when the son and the daughter-in-law visit together, the son uses the same wooden bowl he used before, while the daughter-in-law is given a temporary chinaware bowl. The same applies to the son-in-law, who also does not have his own wooden bowl in his parents-in-law's home. However, the son-in-law who has married into and is living with the family is different. He will definitely have his own wooden bowl because he is the future master of the household. A crack in the wooden bowl is regarded as a sign of bad luck, and the bowl must be replaced. Now that china bowls have become popular, every family uses them as spares for guests. If the edge of a china bowl is clipped, it is also regarded as bad luck and the bowl can no longer be used, especially by the guests. They particularly avoid drinking tea from a cracked bowl in the early morning, and if anyone should do this accidentally and believes in this taboo, he or she will stay at home the entire day just to avoid calamity. 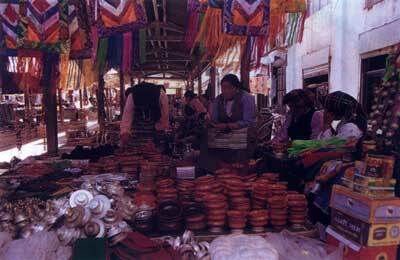 Tibetans, especially travelling artists and lamas, often take their own wooden bowls with them when they travel. They usually carry the bowl in a pocket in the front of their sheep or goatskin or polu woolen robes. An average wooden bowl is cheap but of good quality, and the common people can afford it. It is very important to have one's own bowl. The wooden bowls of the ballad singers are the largest and can hold 2.3 kilograms of buttered tea. Whenever the ballad singers perform in the open at fairs or in markets, they place their wooden bowls beside them, so listeners can toss in their tips. So the wooden bowl, you see, can serve an additional function, to hold money or other things. Lamas also use wooden bowls. People who know the monasteries well can tell which monastery the lama is from by the shape of his bowl. The iron-club lamas who command very high position in the monasteries always move the bowl from one hand to the other playfully, which is quite dazzling. In religious meetings when the iron-club lama keeps order, his wooden bowl is an emblem of authority that is used to knock the heads of those who do not accurately observe the ritual procedures, and they dare not respond. In the old days, the clergy and laity officials making obeisance to the Dalai Lama in the morning were usually awarded three bowls of buttered tea. When a Tibetan dies, his or her family will fill the wooden bowl he or she has used with buttered tea and place it before the corpse. On the seventh day after the celestial burial, a ceremony during which the dead is offered to birds of prey so that the person's spirit can fly into heaven, the family as well as relatives and friends follow the funeral master to the bank of the Lhasa River. In the ceremony, they lay the wooden bowl the dead person used in his or her life time before him or her and repeatedly fill it with tea to wish the dead person's spirit a safe voyage. Finally, they pour the tea out of the wooden bowl, clean it and give it to the funeral master. After that, the bowl belongs to the funeral master. One of the rules among the burial customs is that if the family wants to keep the dead person's wooden bowl for a memento, they must buy it from the funeral master. 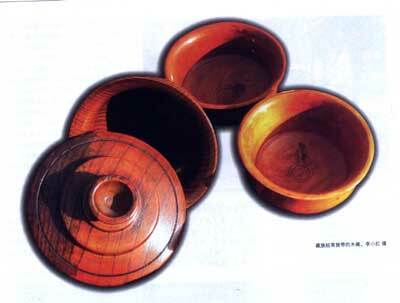 Wooden bowls are produced in both the Tibet Autonomous Region and Deqen in Yunnan Province. In Tibet, Nang County and Zayu County in Nyingchi Prefecture, Gyaca, Lhunze and Cona counties in Shannan Prefecture and Gar in Ngari Prefecture all produce wooden bowls. 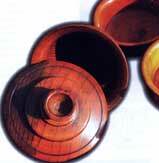 The Chaya wooden bowls produced in Conag and the Duishiu wooden bowls produced in Gar are the most famous. These wooden bowls are made of the roots or stumps of trees. The finest wooden bowls are worth as much as 10 yaks. A Jewish Madonna? is that a mystery?